Based on reviews from 36 experts and 2,125 users. Learn how our rankings work or see our guide to Puma football boots. Updated Apr 2019. The brand is not just known for its trademark Puma logo but also for its top-notch sports footwear, apparel and accessories. Its headquarters is based in Germany and has more than 13,000 employees worldwide. Football boot is one of their leading products. In 1952, they were the very first company to develop a screw-in stud boot called “Super Atom”. It shows how established they are with football innovations which started more than 65 years ago. Puma Atom. The first Puma football boot developed by Puma in 1948. Puma Super Atom. The first ever screw-in stud boot created. A limited modern edition of this Puma football boot was released in 2017. Puma Brasil. The soccer cleats that was considered as the enhanced version of its predecessor, the Super Atom. It was developed in 1952. Puma King. The heritage Puma football boot inspired by one of the best strikers in history, Eusebio of Portugal. It was launched in 1968. Until now, the boot collection still lives on with its modern renditions such as King Top Italian and King II Football boots. Puma Torero. The football cleats invented by the son of Rudolf Dassler, Armin. The boot is known for its DuoFlex sole. Puma Cellerator Shudoh. The Puma football boot that was introduced in 2002. Its forefoot material is made from Schoeller Dynatec, which is the same synthetic found in motorcycle gears. Pittards 80SD Lite Leather is on the heel and side panels. Puma Speed Boot V1.06. The lightest football boots ever invented when it was launched in 2006. Puma PowerCat. The soccer shoes that was developed to combine elements of Puma Power and Control. Puma EvoSpeed.The Puma football boot series that was mainly developed for field acceleration. This lightweight boot was endorsed by the French professional forward Antoine Griezmann. Some of the boots in the series are Evospeed Star Ignite and Evospeed 4.5 Graphic FG. Puma EvoPower. The Puma EvoPower series that was designed for ball control specifically with natural kicking ability. Puma Evopower 3.3 Turf and Evopower Vigor 4 are just some of the boots that belong to this category. Puma EvoAccuracy. As what is name suggests, the Puma football boot series that aims to develop accuracy in shots with the integration of AccuFoam in its upper. It was popularized by Italian striker Mario Balotelli with his popular EvoAccuracy Balotelli boot series. Puma EvoTouch. The silo that was released in 2016. It is intended to strike a balance between comfort and technology. EvoTouch 3 and EvoTouch Pro are firm Ground boots that are part of the category. Puma One. The Puma One series developed to combine elements from EvoSpeed and EvoTouch. It lives by the principles, 3Fs which means “Fit.Feel.Fast”. Silos in the series are Puma One Chrome, Puma One 17.1, Puma One 17.4 Turf and Puma One 17.4 Firm Ground. Puma Future. The latest among the series that was launched in 2017 which debuted with Puma Future Netfit. Netfit technology which was originally designed for running is incorporated in this silo. Other Puma football boot series. Other Puma collections for Indoor and Turf shoes are Invicto, Gavetto, Adreno, and Nevoa. Invicto Fresh and Adreno III Turf are two of the popular shoes from the said collections. NetFit Technology is one of the latest Puma technology breakthroughs with the lacing system. It features a high-grade net that is designed in the upper. It contains holes where shoelaces can be threaded for optimum tailored fit. The said technology is present in the newly launched Puma football boot, Future 18.1. Ignite is an innovation that is inspired by Usain Bolt’s running prowess. It contains a shock-absorbing foam for better comfort and performance while running. It is also seen in Puma’s indoor football shoe series such as with Puma EvoSpeed Star Ignite. Pebax is an outsole technology that is known for its lightweight and flexible qualities. Puma One Chrome is one of the football boots that contains this material. EvoKnit is a lightweight woven material seen in Puma’s integrated boot socks. It is intended to produce a snug fit from the ankles to the forefoot. The Puma One Chrome Firm Ground and Puma 17.1 Firm Ground are some of the mid top football boots that feature this sock technology. AccuFoam is an engineered foam technology that is characterized by three-dimensional dots found on the upper. It is created to enable precision and comfort when controlling the ball. EvoPower Vigor 1 is a firm ground football boot that has this technology. GripTex is a tactile material that creates friction when in contact with the ball for improved strike zones. It can be found in the upper material of boots such as the EvoPower 3.3 Turf. Gradual Stability Frame is an outsole support system inspired by the natural bone mechanism when kicking the ball. It produces stiffness in the heel area and offers footbed support. This frame can be seen in some of the EvoPower boots such as the Evopower 1.2 Firm Ground. AdapLite is an upper innovation featuring a microfiber material embedded in the upper. It is a stretchable material that aims to provide a barefoot sensation when kicking. The special edition EvoAccuracy boot, MB45 has this Japanese-made material for its upper. PowerCell is a compression technology usually found in Puma garments. In Puma football boots such as EvoPower Vigor 3, it is incorporated in the upper to allow next-to-skin sensation when kicking the ball. Features: It is Puma’s surface category with the most number of boot collections. Boots that belong to this group are a mix of mid top and low top football boots. The football boots in this category feature soleplates suitable for a firm or dry natural grass such as the TPU outsoles with a combination of bladed and conical studs. Price range: The most expensive firm ground boot is priced at $300 such as the Puma Future 18.1 Netfit while the most budget-friendly boot is at $45 at their regular rates. Features: Puma turf training boots are designed to work with synthetic-grass surfaces. The outsoles of Puma turf boots have low-profile rubber with multiple studs. Price range: Prices for Puma turf training shoes range from $45.00 to 90.00 at regular rates. Features: Indoor boots from Puma are a combination of a synthetic and Netfit upper. The outsole for the collections is made of the traditional low-profile, non-marking rubber. The boots in this category are labeled as either Indoor training or Court training, which can be interchangeably used in indoor soccer surfaces. Price range: The lowest priced Puma indoor shoe is at $30.00 while the highest priced is at $60.00 at regular rates. 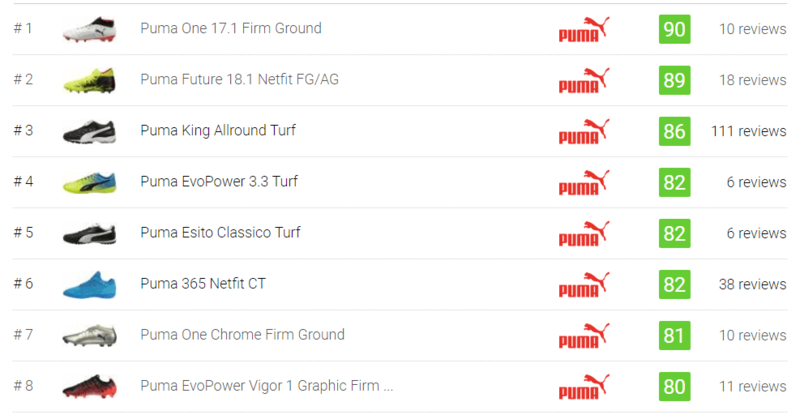 Features: Puma promises velocity and accuracy with their Artificial grass football boot collections. The soleplate technology for the boots is engineered to work best in artificial and dry natural grass. The upper for Puma Artificial grass football boots features either leather or synthetic material. The stud configuration is a combination of bladed and conical studs suited for Artificial Grass. Price range: Prices for this Puma football boots range from $55 to $300. Features: Two of Puma’s classic boot collections comprise this category. The Puma soft ground football boots are designed with metal-tipped conical studs and the traditional fold-over tongue and leather upper. Price range: Esito Classico SG costs $40.00 while King Pro SG is at $95 to $150 range. Puma football boots are also classified according to the boot height. They offer a combination of mid top and low top boots with some of their collections including Puma One and EvoTouch and across surface types such as the firm ground football boots and artificial grass football boots. What sets both types apart is the presence of mid top collars for some of the boots. The most prevalent among the mid top boots is the EvoKnit Sock. The One Chrome and One 17.1 Firm Ground are some of the Puma football boots installed with the comfortable collar sock. EvoKnit technology is a woven material that is constructed to bring lightweight and natural sensation. It offers a slight stretch for comfort but is still guaranteed to provide stability particularly in the ankle area. Other mid top football boots are embedded with a shorter sock extension. As what the name suggests, it mimics a sock sensation and provides the collar some extra padding for protection. The Puma One 17.4 IT is one of the mid top football boots with the said collar. Why choose Puma for your football boots? Puma has a rich history of football shoe development. Way before other brands, Puma has already established their name in the football scene. Puma football boots are a reflection of both heritage and innovation. However, there are behemoth competitors out there such as Adidas and Nike that also bring compelling boots in the market. That is why Puma was recently set to live by their latest company vision which is “Forever Faster”. In this principle, they aim to recover their reliability, particularly with Puma football boots. With the stiff competition out there, what will make someone choose Puma football boots? Pricing. When it comes to pricing, Puma is undoubtedly a bang for the buck. Their rates are relatively affordable in comparison to the more prominent brands while their overall features are at par with them. Newly released Puma football boots usually start at $250 while the most budget-friendly shoes are at $30-$75 at their regular rates. Features. As more and more innovations are being developed to create competitive boots, consumers are faced with a gazillion of football shoe choices. Puma, as one of the viable options, heavily invest on high-end features that are biomechanically proven to perform and provide comfort. The technologies used in Puma football boots are well-tested to ensure quality. EvoKnit and NetFit are two of their innovations focused on comfort. Pebax and Gradual Stability Frame are examples of their outsole technology that are intended for flexibility and acceleration. Performance. Puma football boots are designed based on specific qualities essential in the field such as EvoPower for powerful shots, EvoSpeed for better acceleration, EvoAccuracy for precision in ball control, EvoTouch for guaranteed comfort and among others. It is an indication that essential player needs, and preferences are always the top considerations when designing their shoes. Rudolf Dassler, the company’s founder, is the brother of Adolf Dassler who happens to be the founder of Adidas. Initially, both of them co-founded “Gebrüder Dassler Schuhfabrik“ (Dassler Brothers Shoe Factory), but they ended up creating two separate companies due to a personal and family conflict. The first ever Puma football boot is called “Atom”. Puma invented the first ever screw-in stud boots lead by Rudolf Dassler. Other experts helped in the development of the said boot including West Germany’s national coach Sepp Herberger. In 1953 two new Puma football boots were created as an enhancement to the previous version. They were called “Super Atom” and “Brasil”. Players from German Bundesliga team Hanover 96 gained victory against FC Kaiserslautern. Most them were wearing the Puma football boots, “Brasil”. The trademark logo called “Formstrip” was introduced in 1958. Originally, it was constructed to serve as an internal support for Puma football boots. It is now frequently seen in the lateral and medial sides of Puma football boots. Herbert Burdenski was one of the players in the West German National team who won an epic goal wearing Puma football boots in 1950. The famous Brazilian professional footballer player, Pelé scored two winning goals in the World Cup using Puma boots. He popularized Puma’s heritage line, Puma King, a boot made from Kangaroo leather. In 1974, Johan Cruyff was hailed “Player of the Tournament” and “European Footballer of the Year” while wearing Puma football boots. Diego Maradona wore “Puma Torero” boots in his first ever World Cup match. Few years after he scored the “Goal of the Century” wearing his Puma King boots. Lothar Matthäus was Germany’s leading player in the World Cup held in Italy in 1990. He wore the Puma King boots. Wearing his Puma Trick boots, French player Antoine Griezmann scored six goals and was voted as Player of the Tournament. Does Puma offer customization of their football boots? As of now, customization is just limited to their football jersey. What is Puma’s 30-day Test Run? It is Puma’s program wherein purchasers of select Ignite, Speed Ignite and NRGY shoes will be allowed to use the shoe within 30 days. If they are not satisfied, they can return the product. How do I prolong the life of my Puma football boot? A shoe should be cleaned right after it is exposed to dirt or mud. You are not allowed to machine-wash or machine-dry your shoe. The footbed should always be left dry. Do not expose your shoe to extremely hot conditions or objects such as dryers or radiators. The best way to retain the shape of the shoe is to pack them with crumpled newspaper. How do I maintain my Puma football boot’s upper material? Dampen a soft cloth with mild soap and cold water. Hand wash the shoe using the cloth. Avoid soaking the shoe in water. Dry the shoe in air. Avoid using bleaching agents or harsh cleaning agents. Use a brush to clean the surface of the shoe. The brush to be used should be the type designed to clean suede. Dampen a soft cloth with mild soap and water. A soft-bristle brush can be used as an alternative. Wash the upper using the cloth. Who are some of Puma’s popular football player endorsers? Mario Balotelli is a professional striker from the Italy National team. He endorsed several of Puma’s top of the line boots including limited editions such as EvoPower Stampa and EvoAccuracy boots. Cesc Fàbregas is the central midfielder of the Spain National team. He plays the same position in the Premier League team, Chelsea. A special edition blue and white Evotouch boot was just one of the Puma football boots popularized by Fabregas. Sergio Agüero football professional player from Argentina. He plays as a striker in Manchester City. He was known to wear Pum One cleats during his matches. Marta Vieira da Silva is a footballer who plays professionally in the Brazilian National Women’s team. She plays as a team forward. EvoSpeed boots were one her Puma endorsements. Apart from Puma Football boots, what other football-related merchandise do they offer? What are Puma’s other Business Units aside from Team Sports? On top of Team Sports such as Football, Puma has five other business units namely Running and Training, Golf, Motorsport, Sportstyle, Accessories & Licensing and Kids.